Saturday, April 6th, 10 am. – 12 pm. Community Workshop “Dealing with Debt” with Paul W. Lermitte. Thursday, April 11th, 7 pm. Movie Night. Save the date…This is a Community Event, so please tell your friends about it! Admission by donation with free refreshments and Q & A to follow. Thursday’s, 7-9:30pm. weekly choir practices for Haydn’s Seven Last Words of Christ on the Cross. All who love classical music and read music, are welcome to join including your friends and neighbors! Weekly rehearsals also take place on Saturday at Grace Vancouver Church. The concerts will be on Good Friday at TPC and Holy Saturday at GVC, both at 7pm. another of this way of remembering Jesus’ journey to the cross! hour ahead (Spring Forward) on Saturday evening!!! March 21st, 7 pm. Movie Night – God’s not Dead 2 at TPC. Mark the date and invite your friends. Admission by donation. TPC Youth Meeting – Saturday, March 30th, 12 – 3 pm. Bring a lunch and a friend! February 6 & 7/19. Multiply Conference at Westside Church, 777 Homer St., in Vancouver. Each year church leaders gather to be inspired, equipped, and encouraged under the teaching of practioners who are being used by God to bring renewal and mission reproduction to their churches. Register by December 31/18-139/person, group rate is available for 10 persons and more from the same church. Thursday, February 21, 7pm. Movie Night – The Young Messiah. donation – please save the date and invite your friends! 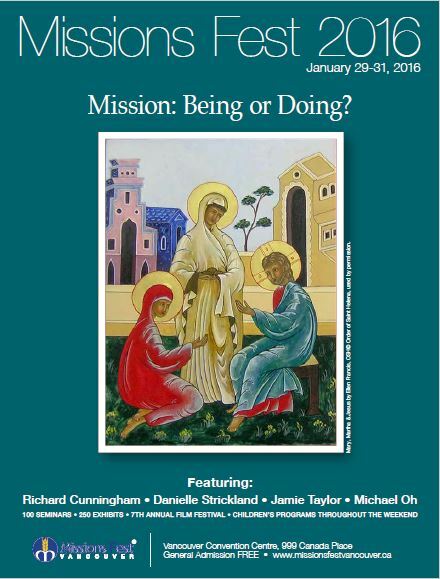 Sunday, February 24th, Disciple-Making Luncheon – directly following our Worship Service. This is your chance to find out more about what the Bible says regarding disciple-making, hearing testimonies, and an opportunity to ask questions! We hope everyone will be there! practices for Haydn’s Seven Last Words of Christ on the Cross. Saturday, January 12/19, 1-5 pm. Prayer Boot Camp. A community workshop exploring a variety of prayer practices. Begin the year with a fresh look at your prayer life. No workshop fee. Thursday, January 17/19, 7 pm. Movie night, mark the date! January 18-20/19. Missions Fest Vancouver. *Missions – Discipling* – mark your calendars and register online if you 18 and older at missionsfestvancouver.ca. Remember to bring proof of registration to the conference. General admission is free. Saturday, December 1st, 11 am. “Bringing in the Greens”. Everyone interested in helping decorate our church for Advent is welcome to come! A foundation of greens will be installed, and you are welcome to add your touch to it. Cider and cookies will be provided. December 6th and 13th, 7 – 9 pm. we meet at TPC for Creative Caroling. If you enjoy singing or play an instrument, please come and bring friends to re-discover Christmas Carols with Pastor Frank. Saturday, December 15th, 7 pm. Celebration with Carols. Scripture, prayer, and Christmas Carols to sing along in creative ways! Invite your friends to this special evening at TPC. Thursday, December 20th, 7 pm. Movie Night “The Nativity Story” is a movie inspired by the Biblical account of Jesus’ birth. Admission is by donation, please invite your friends – everyone is welcome. Tuesday, December 25th, 11 am. Christmas Day service followed by a Christmas lunch. Everyone welcome! your friends. Refreshments will be provided. November 15th, 7 pm. Divine Healing presentation with Pastor Frank. donation. Pastor Patrick will be moderating. November 24th, 9 am. – 5 pm. Healing the Heart of Your Church. This interactive workshop is for everyone interested in the history and healing of Trinity Pacific Church. Please ask Pastor Frank for a copy of the book so that you can prepare. Wednesday, 3rd, 7 pm. in September, Baptism Classes will be starting. Sunday, October 7th, Thanksgiving Summit. If you have photos or stories of what God has been doing at TPC, we’d love to know about them and celebrate Thanksgiving together in this way! Saturday, October 13th, 2 – 5 pm. “Taste and See”, a Community Workshop with Pastor Carlos and Veronica Carrion around Latin American Cuisine. Cost: $10/person. Please register by October 7th. Thursday, October 18th, 7 pm. Movie Night at TPC: “Babettes Feast“. Admission by donation. 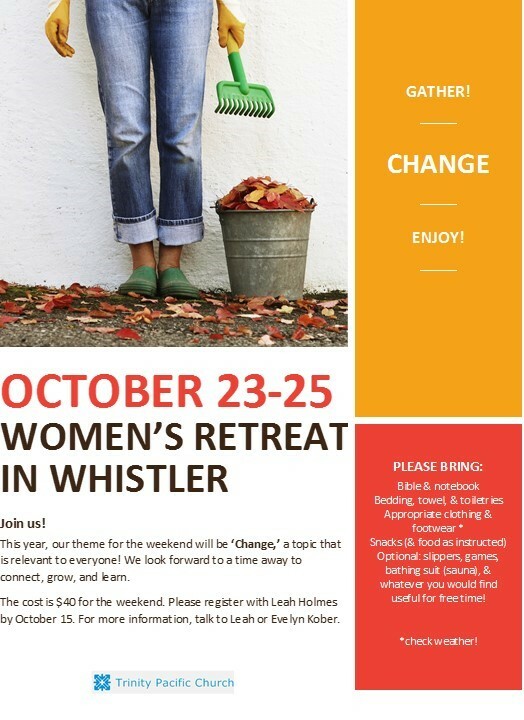 Friday, October 26th – 28th, Women’s Retreat in Whistler. Women of all ages are welcome, including your friends! Please save the date. More details to come. For info speak with Riad or Evelyn. Disciple-Making Groups started up in September. Wednesday, Sept. 12, 7 pm Baptism Classes will be starting. Community Workshop focusing on preserving food by canning, drying and freezing! 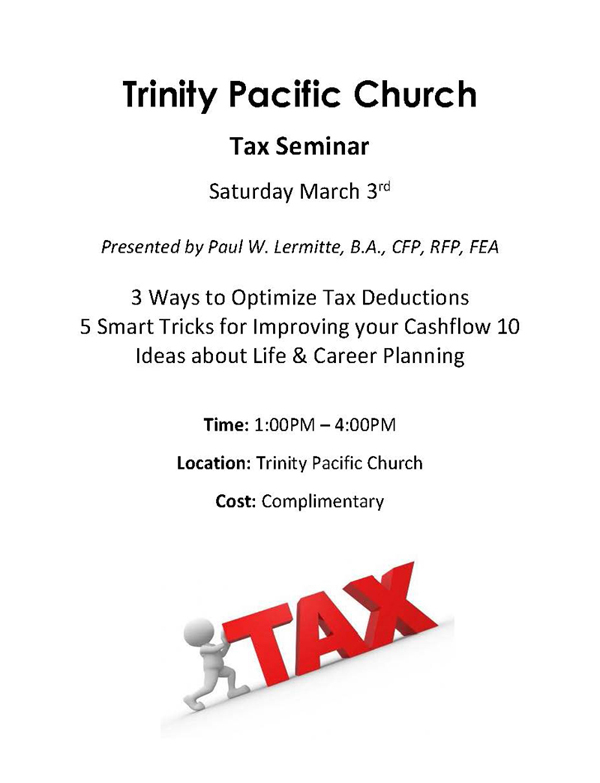 Trinity Pacific Church Admission by Donation Everyone welcome! Work Day at TPC – Saturday, August 25th, from 9 am. – noon. Everyone is welcome to come, if you have any questions you can talk to Carl. 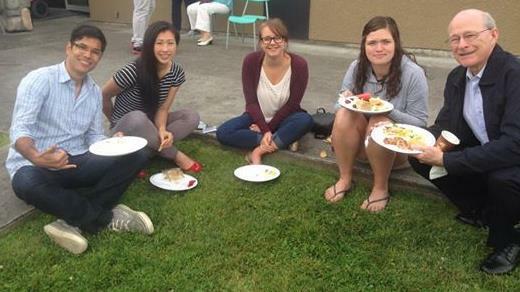 Summer Church Picnic – Sunday, August 26th, on the front lawn after the service. Bring a salad or fruit – burgers will be provided. Lawn chairs, BBQ’s, Bocce balls, and friends are welcome! Disciple-Making Luncheon, July 15th, after the service. Join us for lunch to hear testimonies about the disciple-making process, get a Scriptural understanding of disciple-making and receive an invitation to join a new group. Frank & Friends: Saturday, July 28th, 7 pm. “A Little Water Music”. This free concert is open to everyone who loves a somewhat eclectic mix of classical, contemporary and jazz. Bring your friends. There will also be refreshments during the intermission. Thanksgiving Summit with Potluck: Sunday, June 3rd, following the 11 am service and baptism at the TPC Sanctuary. Everyone is welcome! Ascension Service: Thursday, May 10th, 7 pm. The ALPHA Marriage Course: May 12th – June 23rd. There will be 7 candlelight dinners for the couples, and these will be catered by the singles. The total is $75 per couple, including all course materials. Baptism Course: Thursdays at 7 pm. Meet in the Pastor’s Office, everyone is welcome! Operation Baby Bottle: May 13th – June 17th. Support for the Pregnancy Options Centre, this ministry reaches out to women and couples that are facing an unplanned pregnancy. Please sign out a baby bottle today and over the next few weeks fill it with any spare change, bills, cheques, etc. Community Garden Spring Clean-up: Saturday, April 7th, 11 am. – 2 pm. TPC Community Garden – Volunteers to help with the clean-up will be greatly welcomed (includes lunch). Community Groups: April 10th – May 3rd. These groups will focus on “Christian” and what that means. Men’s Retreat: April 20th – 22nd. Pemberton/Whistler. The theme is “Courageous: Men empowered by the Spirit”. Herbs, Health, and Healing: Saturday, April 21st, 11 am. – 4 pm. Women’s Community Workshop with Edith Rae. $15 fee includes herbs and recipes. Messiah Sing-Along – Thursday’s until March 22nd, from 7 – 9 pm. This will take place every Thursday evening for all those who love Handel’s Messiah, even if you’ve never sung it before! Messiah Sing-Along, Saturday, March 24th, 7 pm. with musicians and soloists. Invite your friends to this special event, everyone is welcome to sing along, or just listen and enjoy the music and words. March 29th, 7 pm. Maundy Thursday Communion Service with optional foot washing. March 30th, 2 – 3 pm. Good Friday Tenebrae Service. Lord’s Supper, Lunch & Thanksgiving Summit, Annual General Meeting – Sunday, March 4th after the service. Disciple Making Luncheon – Sunday, February 11th after the service. Growing in Christ with a support group. Everyone is welcome. Messiah Sing-Along – Starts Thursday, February 15th, from 7 – 9 pm. This will take place every Thursday evening for all those who love Handel’s Messiah, even if you’ve never sung it before! Tour of Union Gospel Mission – Saturday, February 17th. from 9 am. – 2 pm. in New Westminster. There will be car-pooling, more information to come soon. All Night Prayer Vigil – Friday, January 5th, 10 pm. – Saturday, January 6th, 10 am., in the TPC Sanctuary, everyone is welcome! Saturday, January 13th, 1 – 5 pm. – Exploring Spiritual Disciplines Workshop. This free workshop is open to everyone interested in Christian spiritual disciplines. It will focus on Bible teaching, practical experience, 2 series of break-out groups, as well as opportunities for questions. We trust that the Lord will help us make the prayer, “Just a closer walk with Thee” more of a reality for all of us. Thursday, December 21st from 7 – 9 pm. – Creative Caroling – TPC Sanctuary – Everyone welcome! Saturday, December 23rd, 7 pm. – Celebration with Carols – Scripture, prayer and Christmas Carols to sing along in creative ways! 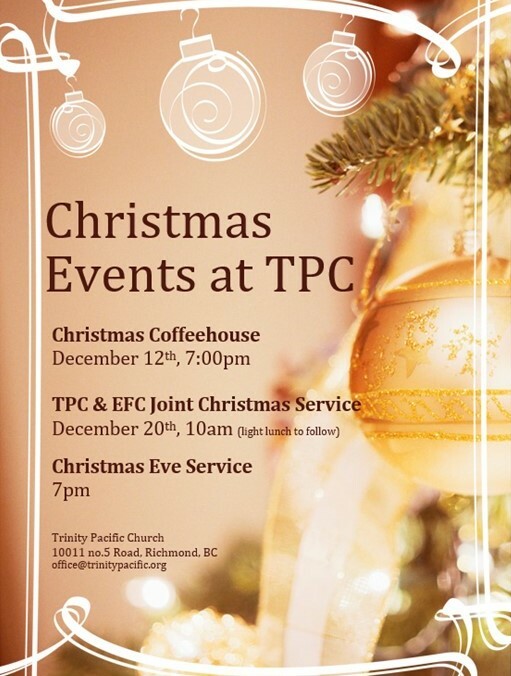 Invite your friends to this special evening at TPC. Monday, December 25th, 11 am. – Christmas Day Service – Christmas carols, Scripture readings and prayers followed by Turkey dinner at 12:30 pm. Happy New Year! May you experience God’s blessings for 2017, in ways you could have never imagined! Start the New Year out well by exploring how you can turn your Good Intentions into Healthy Living in the areas of Mind, Body & Soul. Workshop will include sessions on healthy diet, exercise, mental and spiritual health. December 6th (Tuesday, 7pm): Celebrating St. Nicholas! Join us for an evening to remember Santa traditions that go back to the original St. Nicholas, with Middle Eastern refreshments. November 19th: Operation Christmas Child Packing Party: Join us from 10am-Noon on November 19th to pack boxes together! Our goal is to pack 100 boxes for children in need around the world. Hear powerful stories of the dramatic impact of shoebox gifts in the lives of children! Fill boxes with your letters of love, God’s love, great toys and gifts! Enjoy Christmas goodies and spend time getting to know others who are excited about reaching kids around the world! Join us on October 23 for a Thanksgiving Summit, following the morning service! Together we want to share and give thanks to God for the amazing things He has done in our midst! Potluck lunch for all. Join us from 7-9 for an evening of music and connection. This is a FREE event! Refreshments will be available, by donation toward our pavilion project! Invite a friend and come spend time with us! Join us from 9am-2pm for this garage sale that will also benefit the family of a cancer patient in the Philippines. and his wife, Riad, to join our church family. 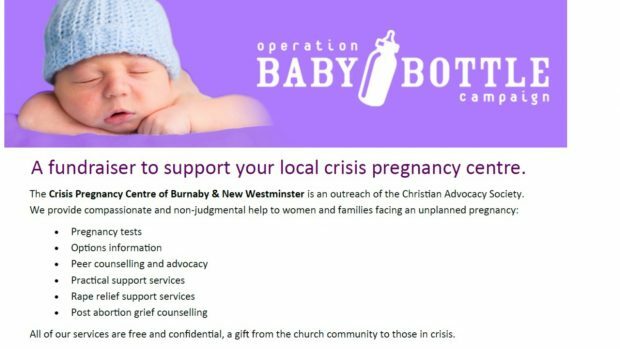 May 8-June 19: Operation Baby Bottle- Annual fundraiser for the Tri-Cities Crisis Pregnancy Center. Pick up your baby bottle piggy bank from the church foyer, and return it by June 19th! May 1: Good Seed Sunday! We hope to see you in our morning service as we celebrate our Creator and His Creation! 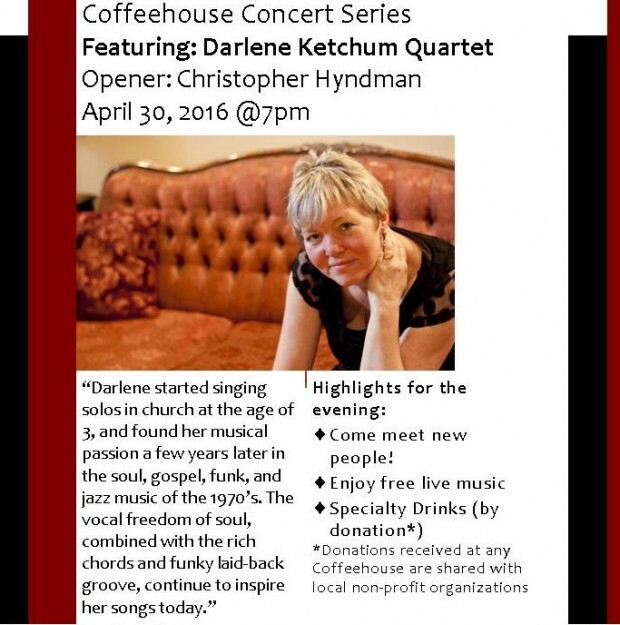 We are so pleased to have Darlene Ketchum and her Quartet join us to offer a fun evening of live entertainment! March 6th: Please join us after our morning service for a light lunch and our Annual General Meeting. March 24th: In lieu of holding a Good Friday service this year, we are having a Maundy Thursday Reflective Service on March 24th, at 7:30pm. This will be an evening of contemplation and reflection, and will include scripture, song & prayer. We have several great events happening during this Christmas season, and hope you are able to share some of them with us! This year we are putting a spin on the usual way we support Operation Christmas Child. Instead of everyone taking a box to fill, we are collecting supplies and will come together to spend an afternoon at a “Pre-Christmas Party,” packing boxes, enjoying company of one another, and having fun! 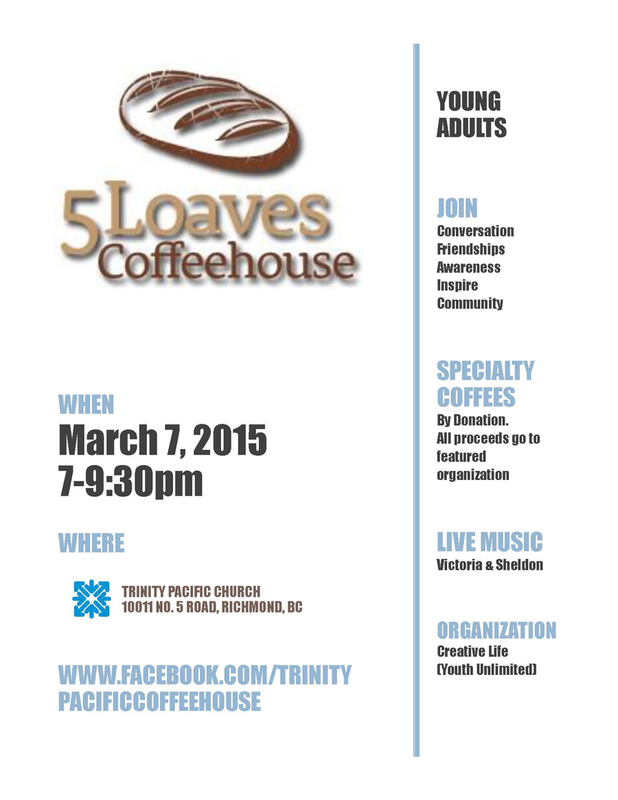 If you would like to be involved, please contact Leah Holmes (or office@trinitypacific.org). There are many ways you can participate. We hope you (and your friends) can join us for this fun event! We are excited about our upcoming retreat. The topic this year- Change- is relevant to all of us. The cost is $40. Please register with Leah Holmes by October 15th. If you have any questions, talk to Leah or Evelyn Kober. 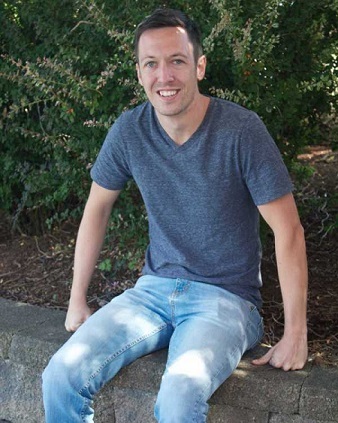 Daniel is a graduate of Summit Pacific Bible College with a Bachelor of Theology and is currently working on his Masters of Theology through Tyndale Seminary. Dan works with Hungry For Life in the Communications Department. After graduating from bible college Dan went into ministry. He felt called to be a part of Hungry For Life when he observed the passion of the people he knew that were already involved with the organization. Since then his belief in what HFL does has only grown. Curtis will share some of his own personal story. We’re looking forward to welcoming Pastor Curtis to our midst! Stay after for a Welcome Tea. 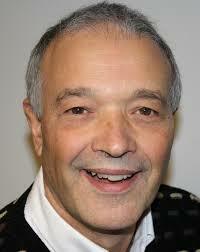 We are excited to have Dennis return to TPC to share God’s message with us. Dennis is a dynamic engaging speaker and we are happy to have him back! Come out Sunday morning and join us! Dennis and Mistin Wilkinson live in Vancouver’s West End with their four children. They do mission by inviting people into the events and rhythms of their everyday life where they live and speak the good news of Jesus Christ. Dennis developed Meta Talks for engaging people of all beliefs and practices in discussing this good news. He is a passionate and persuasive speaker in sharing God’s better story in Jesus. Jon is a pastoral leadership student at Pacific Bible College in Surrey. 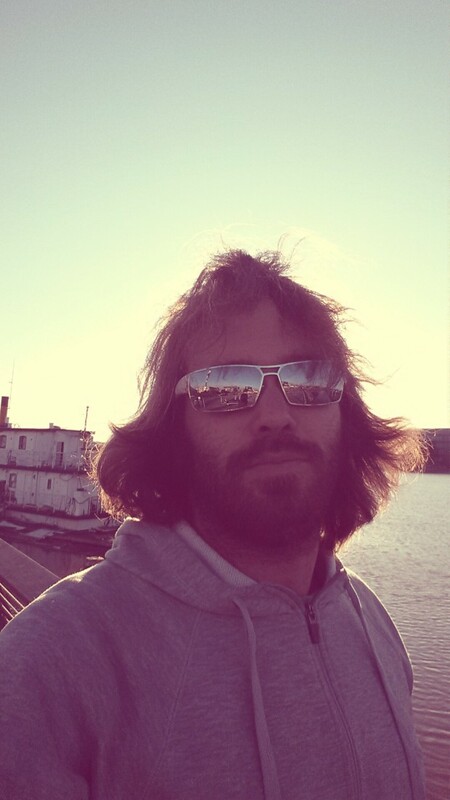 Here’s a snippet of what Jon has to say about himself: i love God, people, music and sports. i consider myself a fairly regular down to earth guy (who just happens to be going into ministry) and feel God wants me to be myself and pretend like i’m some “holier than thou” saint. people can forget pastors are regular people and put them up on some pedestal and i don’t believe that is what healthy church is. in the body of Christ, EVERY part is significant. i really believe that! He wants me to be real and authentic, to try and make church like that too! Kerry shared a great message with us about using inductive study methods to study the Bible. Using the book of Jonah as an example, he taught us some basic skills. Interested in the powerpoint that provides more detail about the method he has developed? Interested in listening to some of the YouTube videos created by his students? Check out this file by clicking on the link below. Kerry grew up in Richmond and then lived in Hawaii, Thailand and Hong Kong working with Youth With A Mission, primarily teaching and directing a School of Biblical Studies. He pastored in the Lower Mainland for 11 years before returning to Asia. For the past seven years Kerry has taught middle schoolers in a Christian international school in Seoul, Korea. 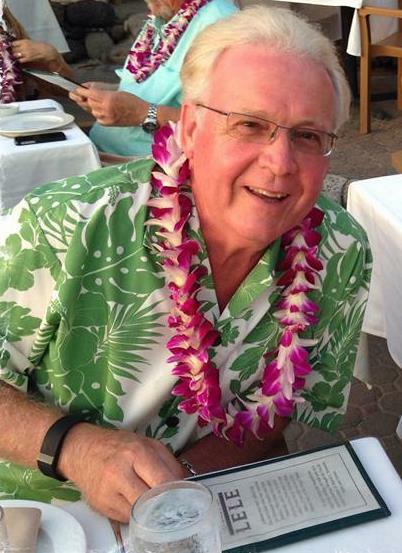 He has strong ties to Trinity Pacific Church, having attended in the past, and having extended family and friends there. 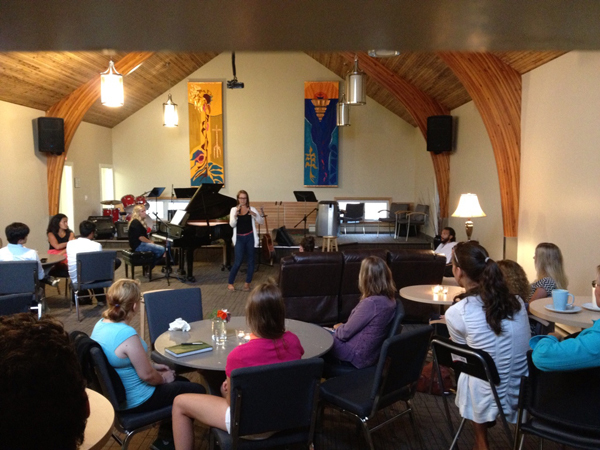 Our next 5 Loaves Coffeehouse is happening June 27, 7 – 9:30 pm. It’s Open Mic Night! Come Join us! This month we are also hosting a BBQ on the church property before the 5 Loaves Coffee House. Come on over at 5:30 for a bite to eat, stay for ice cream at 6:30, then head inside for Coffee House, live music and great special drinks and yummies. A Community multi-table Garage sale is being organized by one of our church members. Everyone is welcome to come and find some treasures! Nathan is the pastor at Rosedale Community Church of God in Chilliwack. Rob was Youth Pastor at Maple Ridge Baptist Church for 12 years, 2000-2012. From 2012 to the present Rob has been Director of Youth Ministries with the Fellowship of Evangelical Baptists/Pacific. Rob and his wife, Jenny, have three teenagers, and are members at Maple Ridge Baptist. Community Garden Seed Swap and Seed Paper-Making Workshop, Saturday May 9, 1:00-3:00 pm. 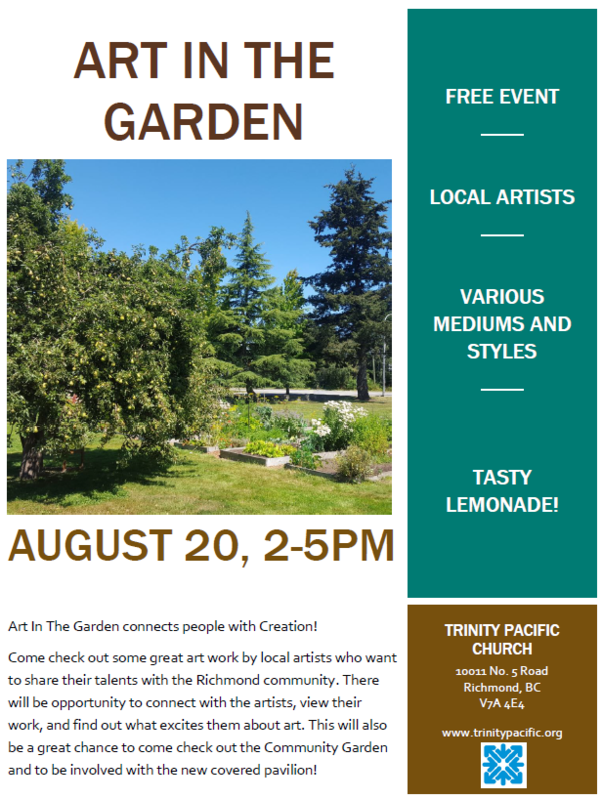 The TPC Community Garden is involved in a very special event and is inviting us to participate! Karisa Evdokimoff, one of our gardeners, is a Richmond artist involved in a province-wide art and bee-keeping project. See the Community Garden page for more details. Good Seed Sunday, Sunday April 26th. We want to celebrate and worship in light of Creation Care. Come join us at 11 a.m. for the worship service. Speaker, our own David Cheng. Congregational Potluck Dinner and Discussion, April 18, 6:00-8:30 pm at the church. As a follow up to the ReFrame series, the board would like to invite you to come out to share your thoughts on the future of our church, ministry plans, and how to translate our mission and vision into plans and goals, by the leading of the Spirit. Community Garden Workday and Potluck is April 11, from 10 – 2. 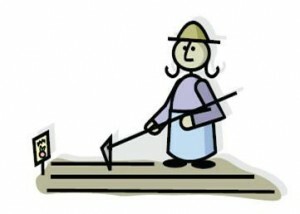 Come join the fun and bring along a spade so you can help with clean up around the plots! Guaranteed to make you happy! Potluck lunch is planned—feel free to contribute to it! We will celebrate Christ’s resurrection with a joint Easter service with the EFC family. 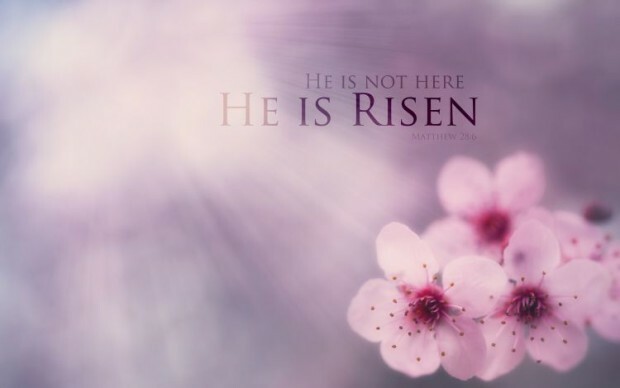 Pastor Jack Lai will be preaching, both the adult choir and the children’s choir will sing; we will share communion, and tea will be served after the service. Please join us! On Tuesday, March 3, we are meeting together for a potluck dinner and a ReFrame discussion at TPC. For the past three years we have joined the Richmond “Eating Together” plans to bring communities together for a meal. What should you bring? If you haven’t already contacted Emily, please bring something to share with four or five other people–entree, salad or dessert. ReFrame is the new approach to Sunday morning at TPC! What is it? A 10 week interactive film-based series exploring what it means to follow Christ in the modern era. Who is it for? Anyone – scientists, artists, homemakers, janitors, engineers, farmers, anyone who would like to see the Gospel with fresh eyes and experience the renewing power of Jesus Christ in every aspect of their lives. What is the cost? It’s free! Can I join if I have missed some of the first sessions? It will be most valuable to attend all 10 weeks, but course material is available for missed sessions. We are excited to have Pastor Carlos share God’s word with us again this Sunday! His inspiring stories of the way that God is at work among the local migrant workers community are always a good reminder of God’s faithfulness! Please join us! Ken and his wife Teresa will be joining us this Sunday. Ken is speaking on the topic, “Shaping a Godly Identity.” Come out, and stay after for our monthly coffee time! Rob and his wife, Jenny, have three teen children, and are members at Maple Ridge Baptist. Pastor Jack Lai will share the message and our own TPC worship team will provide some of the music. Come out and bring your friends! A light lunch will be served after the service. Todd is part of the Ministry Lifecycles Team for Fellowship Pacific. He and his wife Karen live in Abbotsford, B.C. Cookies and Carols Coffee House, December 13th, 7 – 9 p.m. Invite your neighbours and friends to this fun, casual evening of cookies and caroling. Live music, Christmas baking, special coffee drinks, and carol-singing included! Bring along a donation for the Richmond Food Bank. We are very excited to have Dennis Wilkinson with us to share God’s message during our Sunday morning service. Dennis and Mistin Wilkinson live in Vancouver’s West End with their four children. They do mission by inviting people into the events and rhythms of their everyday life where they live and speak the good news of Jesus Christ. Dennis developed Meta Talks for engaging people of all beliefs and practices in discussing this good news. He is a passionate and persuasive speaker in sharing God’s better story in Jesus. Recently Dennis and Mistin were in the Vancouver news when their meta community group filled more than 115 Christmas boxes for Operation Christmas Child, to be sent overseas through Samaritan’s Purse. Rob shared a fabulous message with us and revisited the story of the prodigal son. Our next 5 Loaves Coffeehouse is November 8, 6 – 10 pm. Our focus ministry is Inner Hope of Vancouver. 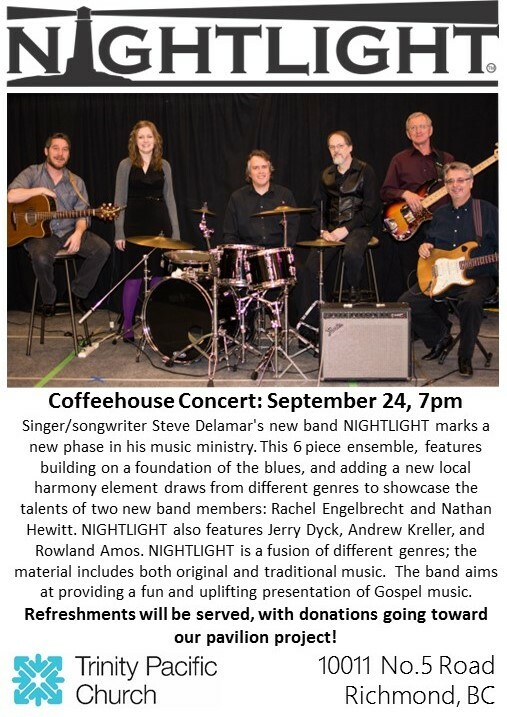 Come out for live music, good conversation, and yummy treats and coffee drinks. Bring your friends! 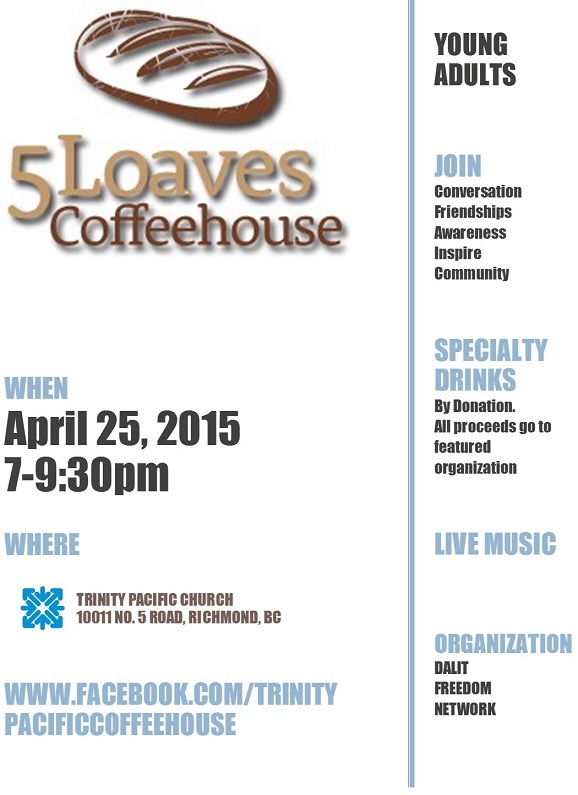 Fundraising Dinner for the Spanish Migrant Workers Ministry, 6 pm at Ladner Baptist Church. For more information on this ministry, click here: https://www.trinitypacific.org/?page_id=2790 Everyone welcome! If you are interested in attending, contact Barb and David Cheng. Women’s Retreat, Whistler October 24-26. Carol O’Leary of Young Life will facilitate. We are very excited to have Carol join us for a fresh take on “Rooted in Christ.” Carol usually organizes huge Women’s retreats at Rock Ridge Canyon Camp in Princeton. Her enthusiasm and love for Christ are inspiring. A few spots are still left at the retreat. Contact the Church office if you are interested in coming. Ken brings a wealth of experience and encouragement! You won’t want to miss him when he comes to share with TPC during the morning service at 11 a.m.
Join us for lunch at the church after service at 12:30. Everyone is welcome! We want to honour Rod and Joan as they begin a short sabbatical. Join us for a potluck dinner at the church on Tuesday evening at 6:30. Bring a dish to share and some drinks for your family! Hear members of our small groups share about what they are doing and experiencing in their groups. Dessert will be provided for everyone! Come along–it will be fun! Dennis was our guest speaker during the Sunday service. He gave us lots to think about and inspired us to remember what it means to “become” a Christian. Thanks for coming, Dennis! Pastor Rod is leading two different studies, 6 classes each. Discovery in Christian Basics —covers the topics: God, salvation, baptism, the church, and Christian growth. This class runs Wednesday evenings at 7 pm in the church building, throughout the summer. You are welcome to drop in. The First Principles of the Faith. This foundational course has begun and will be meeting throughout August at 1:30 pm on Tuesday afternoons, in Steveston. Please contact the office if you want to join in. Rob was our guest speaker during the Sunday service. We are very grateful he came! Rob was Youth Pastor at Maple Ridge Baptist Church for 12 years, 2000-2012. 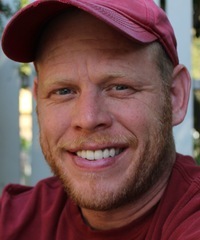 From 2012 to the present Rob has been Director of Youth Ministries with the Fellowship of Evangelical Baptists/Pacific. This fun event took place after service on June 15. Lots of great food and fellowship took place! Everyone who attended agreed that Mark’s workshop provided a great introduction to the topic, but many people expressed interest in more training. Stay tuned for some additional opportunities! Thank you to everyone who participated in the fundraiser for Tri-cities Pregnancy Concerns. You are making a difference! See their website for more information about this worthwhile organization. 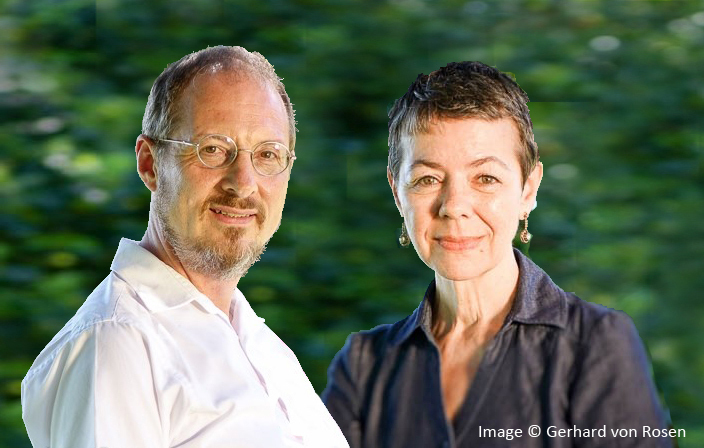 On May 11, 2014 we launched our new, updated website!